It's hard to believe that two weeks have past and one of the most important people in my life was on her death bed. On Saturday, June 16, 2012, Pearl Zivitz was bed ridden in Boca Raton, Florida, approaching her final hours battling Alzheimer's Disease. 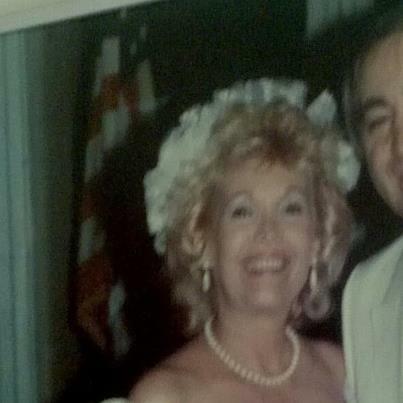 This woman was My Godmother and Aunt all rolled into one. I had a strong feeling she wouldn't make it through that weekend but I was determined to spend these final hours with a woman, who I spent so many great times with. During the weekend, I knew that I was prepared to write the best eulogy that I could to give her a tribute she would be proud of. These past two weeks have been a whirlwind for my adopted sister & brother Cindy and Peter Spyke along with Pearl's loving husband Harvey. There were so many thoughts that entered all of our minds this weekend. I even wondered what I was going to wear at the forthcoming funeral and these family members supported my choice of attire with a Green USF Bulls Golf Shirt and a Black Pair of Jeans with Brown Shoes. My decision to where these clothes was due to the fact that when I moved to Florida back in 1981, I was determined to leave the state with a BA Degree and all of that came to fruition in August of 1986. Pearl's endless moral support and loving companionship enabled me to turn this goal into a reality, and to this day, I proudly wear my college ring and expect to be buried with it when my life ends. During this blog, I am going to share the eulogy with you and hope you enjoy it as much as I worked hard to write then speak it. Prior to The Summer of 1979, I was always known as her Cousin Sophie Morganroth's Grandson. But on One Summer Day in Bloomfield Hills, MI, at an Uncle's House, Pearl Cullen and I spent three of the Most Incredible Hours together. If there were two people who clicked, We Did! A year later, I went to Florida with three friends and we ran across a Con-Artist who swindled us out of money. My friends went back to Michigan while My Grandmother Sophie contacted Pearl, who invited me to stay with her and her husband Fred for 10 days. Pearl picked me up at a Greyhound Station and we had a blast. I had so much fun with Pearl, Fred, Cindy and Steve that I wanted to move to Florida after I Graduated from High School in 1981. During this Tribute, it would be virtually Impossible to Describe the Amount of Great Times We Had Together. So I took a page out of My Favorite Show ESPN's Sports Center To Come -up with a Top 10. Also known as Cindy Stevens, Pearl was used to Performing in front of crowds. Now it's time Pearl for someone to Honor You before you take your One-Way Trip To Heaven. 1) During the 1980 Vacation, Pearl was having problems with her Air Conditioning in her Maroon Chevrolet Monte Carlo. We sat in a restaurant and we were talking to each other how it stinks that the AC wasn't working in the summer. We were telling customers not to do business with Bill Kelley Chevrolet. It just so happened that day, Kelley was in the Restaurant and both of us Spoke Our Minds. Kelley gave us his business card and personal number. A week later, Kelley kept his word and Pearl once again had air conditioning---after several months of problems. 2) When I was a Sports Writer for the Hallandale Digest, I would take My Blonde Bomber with me to Cover Stories. At Allen Park Gym in North Miami Beach, Pearl and I met Muhammad Ali, the greatest fighter of All-Time. 3) When I worked for Pearl and Fred at the Little River Flea Market in Miami, they needed a Santa Claus. At 110 pounds, this Ho, Ho, Ho Kid needed Four Pillows to Look Legitimate. 4) It tore me apart to see Pearl and Fred not get along because I Loved them Both Very Much. But I took Pearl to see Rocky 3 and I introduced her to a song "Eye Of The Tiger." We saw this movie twice and this song gave her the courage and strength to get a Divorce which Ultimately led to her second marriage to Harvey Zivitz. 5) In 1981, Pearl bought an Airplane Ticket to come to My Lakeland High School Graduation! 6) I will never forget the time when we were driving home from the Flea Market and I told her to take a different way which turned out to be a much faster to avoid traffic. Pearl asked me how did I know this route on North Miami Ave? I responded, "Uncle Fred Showed Me." Pearl smiled and said. "You know more about these roads than I do and I've been here 40 Years." 7) At Her First Apt Three Islands in Hallandale, Pearl panicked because her power went off. I raced back from Hollywood and turned her fuses on. She hugged and kissed me then we went out to dinner. 8) Pearl and Harvey never knew that The Cracker Barrel Restaurant Made A great Thanksgiving Dinner but found out when we went to the Boynton Beach Location. They liked it so much, we went back again. I always enjoyed spending Thanksgiving Dinners with Pearl Harvey, Steve, Cindy and Pete. Prior to Harvey, Fred was a lot of fun as well. 9) Going to Cindy & Peter's Wedding in Fort Pierce was truly Special seeing her Princess Land Her Prince. These Days Cindy is the Older Sister I Never Had and Peter is the Older Brother I Never Had. I Love Them Both Very Much and Am Proud To Have Them In My Life! 10) Over the weekend, culminating with her death on Sunday, I was so proud to spend an uninterrupted hour with Pearl. As I spoke to her, Internally, I felt that Real Connection. It was an Honor and Privilege to be the One Holding Her Hand When She died! She always viewed me as her Third Baby. I reminded her of The Eye Of The Tiger, Put My USF College Ring on Her Hand, Showed Pearl The Photo of Muhammad Ali and I. Then I told her I Loved Her, kissed her head and hand. I told her she'll be reunited with Great People and said "It's Ok For You To Go Rest in Peace." Then I Felt Her Hand Go Cold as She Passed Away. When I put things in perspective, My First Exposure to death occurred One Fall Afternoon at Tiger Stadium in Detroit on October 24, 1971 on a 60 Degree Afternoon. Detroit Lions WR Chuck Hughes died of a Heart Attack at the Age of 28. To date, he's the only player to die in an NFL Game. I was eight at the time, had nightmares, and slept in my Father's Bed That Night. A crowd of 54,418 fans saw history For all the wrong reasons. The game ended in silence. On Sunday June 17, 2012, a crowd of three family members, Myself, Cindy and Peter were at Pearl's Century Village Apt when she passed away for all the right reasons. After 11 days of Hospice Care fighting hard to continue, the suffering ended as an Incredible 86-year run on Earth Concluded. I wasn't Prepared to Handle Hughes stunning death. But 41-years later, I Handled Pearl's passing Much Better. I've always viewed her as My Godmother. She knew it. Our memories go Way Beyond this Top 10. I used to drive her crazy swimming in a lake behind her house with alligators in it. But I didn't know any better and was too skinny for them to eat me. As I Conclude this Tribute, I found it Ironic that Pearl was born in Michigan and died on a day when NASCAR held it's race at the Michigan International Speedway. Pete watched the Race While Instead of Having The Eye Of The Tiger, My Eyes were solely Focused on My Beloved Godmother until the end. This is One Time I Never Cared About Sports, Just You Pearl! All I can say Pearl is Thank-You Very Much For Everything and know that I'll Always Love You. Holding Your Hand Is A Gift I'll Never Forget When You Died. Rest In Peace and All of Us Will Live In Peace knowing YOU'RE RESTING IN PEACE.